Nassau, The Bahamas - Minister of National Security, the Hon. Marvin Dames and his wife Stacey, his Permanent Secretary Eugene Poitier, and Commander of the Royal Bahamas Defence Force Commodore Tellis Bethel joined the British Legion -- Bahamas Branch (BLBB), RBDF officers and Government uniformed personnel, veterans, family members and stakeholders at the Centennial Military Ball, held at the British Colonial Hilton, on November 3, 2018. The event celebrated to the 100th Anniversary of the ending of World War I. Also taking part in the event were Chairman of the BLBB Bishop Cephas Ferguson, BBLB Liaison Officer Commander Shondel Pinder, BLBB Executive Secretary and RBDF Reservist Adina Munroe-Charlow, and BLBB Chaplin / Advisor Father Andrew Toppin. The BLBB documentary "We Will Remember Them" debuted that evening and the RBDF Band, Charles Zonicle, JoAnn Callender and representatives of the Bel Canto Singers provided entertainment. The evening featured presentation of awards to civic groups, corporate Bahamas Government Uniformed Departments, as well as special presentations to the family of the Late Sir Etienne Dupuch, a spouses presentation, and a Special Roll Call of WWII veterans in attendance. 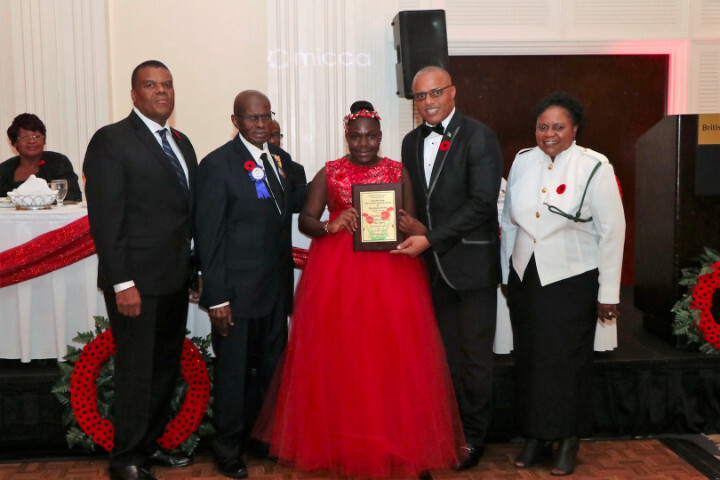 Of note were presentations to young Girls Brigade member Miss Clintaysia Ferguson -- who raised $5,000 in poppy sales last year, and the recognition of Widow Lillian Humes -- the oldest member of the BLBB at 104 years old and the spouse of former chairman the Late Comrade Audley Humes.